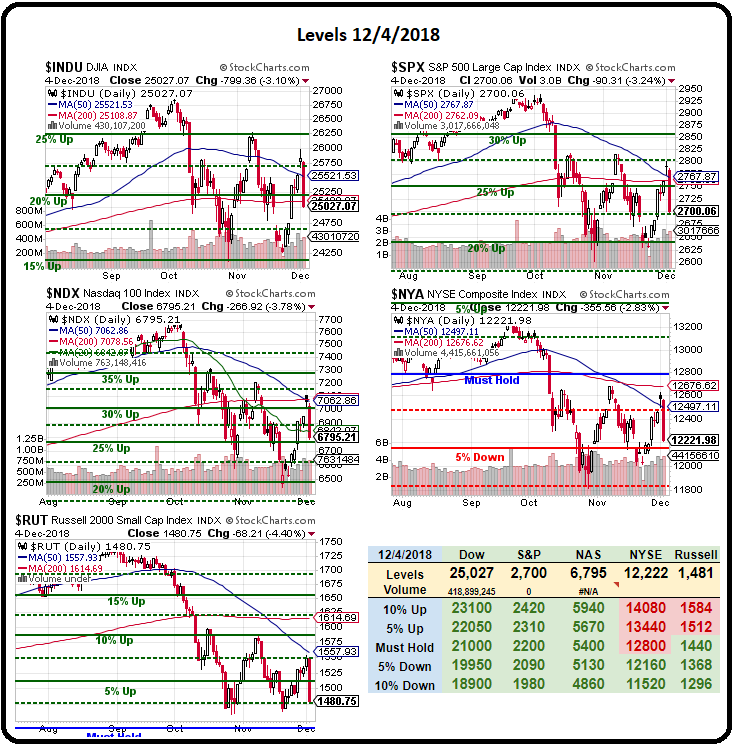 Follow-Through Thursday – 5% Correction or Just the First Step? When you think about it, of course, not only has NOTHING changed since last week but now we know for sure there will be no trade deal until March at best. Trump showed real weakness backing down on more tariffs since that was the only leverage he had in this negotiation and China's tariffs have always been retaliatory – so Xi has given up nothing at all and Trump has stopped fighting – how is that worth $500Bn of stock advances? All pretenses of improving US-China relations were dashed yesterday evening as news spread that the CFO of Huawei was arrested in Canada on Dec 1st, at the behest of US Authorities over "Iran Sanction Violations" – something the company claims to have had no notice of and no one was more shocked (or insulted) than China's President Xi, who was pretty much sitting down to dinner with Donald Trump at the time and was embarrassingly clueless that this was happening. Making a Chinese leader look clueless has historically been a big mistake…. The United States is “resorting to despicable hooliganism,” China's Global Times wrote in an editorial published Thursday. “Anybody can see that the United States is maliciously picking holes in Huawei, trying to give it a hard time using the American legal system,” said the paper, which often reflects the foreign policy views of the ruling Communist Party. The “persecution” of Huawei is “clearly contrary to the spirit of the consensus” forged between Trump and Xi, it said. Earlier this year, ZTE was sanctioned by the US but all was forgiven after they paid a record $892M fine in what China widely regarded as a shake-down. Huawei has not been formally accused of breaching the sanctions and Meng Wanzhou is the daughter of the company's founder, leading to many Chinese essentially viewing this as a kidnapping and any "fine" the US decides to levy will be seen as a ransom demand. Huawei employs 180,000 people in some 170 countries and earned $92.5 Billion last year. It is the world’s third-largest seller of smartphones, after Apple and Samsung, and expects to sell 200M handsets this year. Recently, the company was accused of installing spyware in their phones and network devices but no evidence of this was ever uncovered – just a lot of accusations by right-wing news sources in the US. Nonetheless, Trump signed a bill in August banning Government agencies from using Huawei and ZTE devices. Technically, things are already very ugly. Yesterday and today's move have greatly strengthened the "Death Cross" patterns we talked about yesterday morning and there is nothing more bearish on a stock chart than a failing "W" pattern, especially when you break through the floor you've tested two times before while making lower highs on the bounces. I'd say watch the Russell but the Futures have /RTY already at 1,460 but it held 1,455 and we have been playing for bullish bounces in our Live Member Chat Room this morning. I guess we'll watch the NYSE at the 12,000 line as that's obviously DOOM!, if we fail there, but this is nothing more than the 5% correction we expected, only briefly interrupted by complete and utter BS from Team Trump while they stabbed President Xi in the back as the President distracted him with dinner and false smiles – do you really think there won't be repercussions from this? Not since Bush Jr's war on Iraq and Afghanistan over the attack on the World Trade Center by 19 Saudis has America had such a screwed-up foreign policy agenda, and we all know how that turned out for us in 2008. Trump won't need to wait 6 years for his idiocy to come back to haunt us and we're already seeing the rumblings all around but, like people who live on a fault line – we're happy to deny it all until our house is under the ground and then we'll all beg for bailouts because "we didn't see it coming." /NQ at 6,666 – maybe a sign? 24,600 is a good spot to play for a bounce on /YM but so will 24,500 be so tight stops below. 2,650 on /ES is a good bottom too and 1,455 on /RTY would be nice if they hit 1,450 but no luck yet. We're going to be looking for a 1% (weak) bounce off the lows and the indexes will have to get back to flat for the day to make the strong bounce lines. Anything less than that and we will remain fairly bearish and, to be clear, we're just looking for Egg McMuffin money on the longs so quick profits will be taken if the indexes are rejected as lower is just as likely as higher at this point. Tomorrow, at 8:30am, we get the Non-Farm Payroll Report and it's not likely to be too market moving but at least it will provide the bulls an excuse to try to salvage the week – if they can.